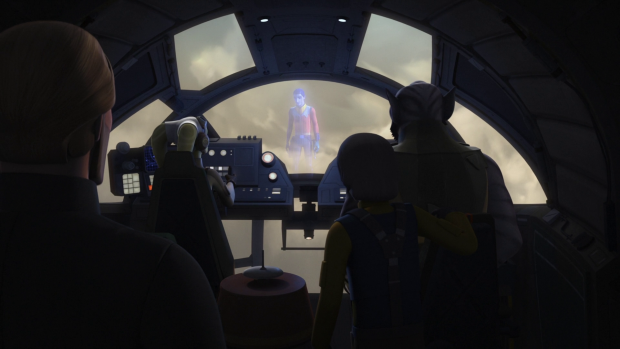 Kneel Before Blog - Star Wars Rebels - "Family Reunion" and "Farewell"
Star Wars Rebels ends its four season run with a last stand in defence of Lothal and closure on the various arcs the show has developed. Finales are hard. Saying goodbye to a beloved show is a difficult task for any fan so the writers have an uphill struggle when it comes to delivering something that proves satisfactory for those who have stuck with the show since it began. Star Wars Rebels has been building up to its conclusion all season with a particular focus on moving towards the endgame in the last handful. The writers knew what the end point was and built up to it organically. The victory achieved in the previous episode is the launching pad for the next phase of their attack. Not wanting to lose their momentum the decision is made to take the fight right to the Empire by assaulting the dome in the city complete with a plan that’s just crazy enough to work. Overcoming seemingly insurmountable odds and snatching victory from the jaws of defeat has been a staple of many episodes of this show so it’s good to see it end on a familiar note. There are lots of phases to the plan and it plays out well despite the surface level complexity. It never feels bogged down in detail or confusing and there’s enough jeopardy to prevent it from feeling like an easy victory considering how quickly they secure the dome. Of course it isn’t the end but the episode does burn through plot very quickly because there is so much for them to get through. 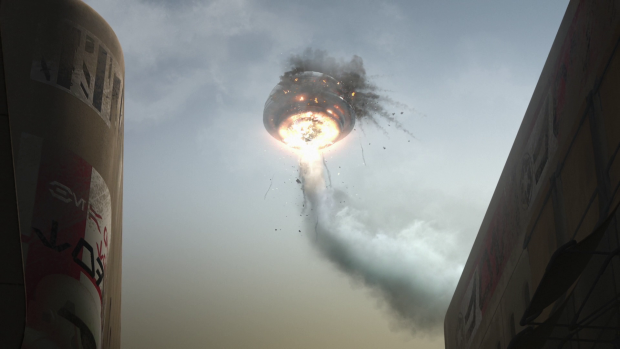 In general the action in the early part of the finale is good but not as good as the sequences in the previous episode though the finale is more about maintaining tension at first rather than delivering spectacle. Taking the control room was one thing but keeping it was quite another. The presence of Thrawn looming over the city with his Star Destroyers and making the very real threat to level the city establishes the stakes and presents Ezra with a clear choice. 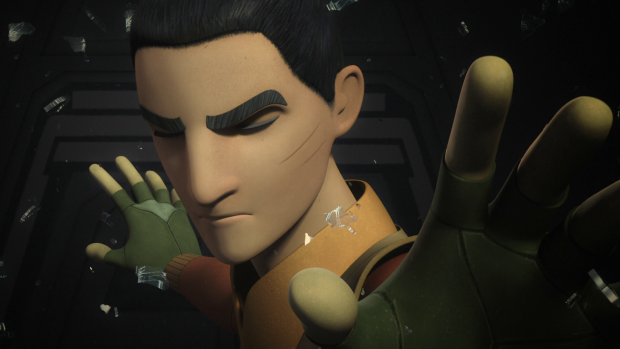 He can surrender himself to protect the people of Lothal or stay where he is and doom everyone to death. Being a hero Ezra chooses to surrender after realising that Thrawn isn’t messing around. What follows is the fairly standard protests from everyone around him begging him not to go and to find another way. Ezra pretends to play along but makes himself scarce while everyone else is working on planning their next move. Sabine is the one to realise what Ezra has to do and helps him slip away. It’s such a great scene with deep emotional resonance and a lot established with absolutely no dialogue. The animators do a fantastic job communicating everything felt by Ezra and Sabine through their facial expressions and the score accompanies this perfectly. Once again this shows the strong bond established between Ezra and Sabine and how in sync they are. Sabine’s practical nature comes into play as well as she realises that letting Ezra surrender himself is the only chance they have against Thrawn. Once the others realise that Ezra is gone Hera appeals to him to change his mind resulting in a really moving exchange reinforcing the familial bond established between the Ghost crew. Thrawn shows Ezra everything of Lothal he has collected in an effort to confirm to him that the planet’s culture will live on in some way after he has destroyed it which only serves to anger Ezra and fuel his motivation to gain the upper hand. The conversation confirms that the entire planet is at stake because Thrawn doesn’t care about what happens to it or its people. Even if it kills Ezra he clearly resolves to find a way to save Lothal. 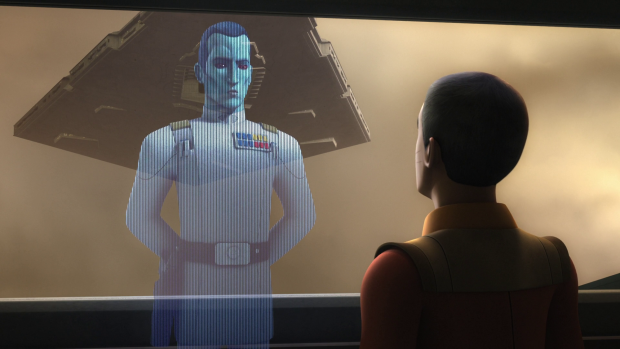 Ezra is taken to the Emperor who appears via vanity hologram showing him how he appeared before his face was scarred. He’s more Palpatine than Sideous and even speaks in a softer tone to put him more at ease. My first thought was that Palpatine would try to convince Ezra to become his apprentice because that’s the sort of thing he always does but his plans are far more sinister than that. He offers Ezra the opportunity to change his own fate by travelling back in time to save his parents. Ezra stands looking at the window to the past hearing his parents call to him and considering whether he should take this opportunity or not. The temptation clearly weighs heavily on him and Palpatine knows it. He continues to push Ezra into making the decision to change the pass and reclaim the life that he arguably deserved. It’s a really tense moment with a chilling vocal performance from Ian McDiarmid playing Palpatine at his most manipulative. the soft disarming tone is eerie and the visuals compliment this wonderfully as Ezra is clearly torn on what to do. For a short time it almost seems like Ezra will give into temptation especially when considering his flirtation with the Dark Side in the past. Ultimately he comes to his senses and remembers the lesson he learned in “A World Between Worlds“. 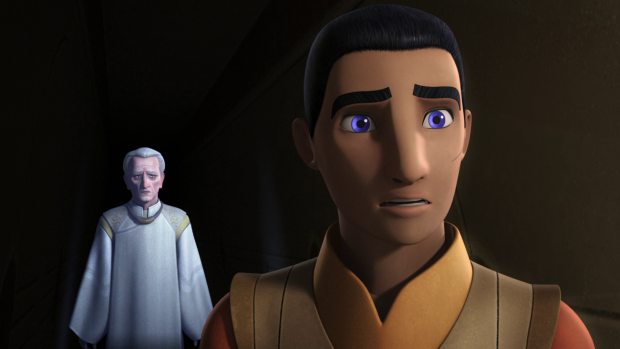 In that episode he learned that Kanan’s sacrifice was important to everyone else around him and that undoing it would have wide reaching consequences. The same applies here as saving his parents would be a significant alteration to the timeline with consequences that he can’t even begin to imagine. For good or for ill every decision made by him and his friends has brought him to that moment and he chooses to let the life he knows continue. Ezra’s choice allows him to let his parents go and accept that they are lost to him while reaffirming his loyalty to his new family who deserve to have their lives remain as they are despite all of the hardships. It’s a powerful decision and a real turning point for Ezra who chooses to stop fixating the past and concentrate on the here and now which funnily enough is one of Yoda’s lessons. It’s important for a Jedi not to fixate on what could be and concentrate on what is. Ezra now understands that and forges ahead with renewed confidence. It’s also really brave and refreshing to have such a key character beat not be about Ezra fighting with a lightsaber. A tense, introspective and emotionally deep personal choice with the decision itself creating the suspense is a lot better in this case. Ezra’s decision to defy Palpatine plays as something of a mirror to Anakin’s choice to side with him and offers similarities to Luke’s eventual decision to embrace the Light Side of the Force. Star Wars has always had complimentary beats that play out differently every time they are referenced so it’s good to see that technique echoed here as it cements the importance of this show in the Star Wars canon. Palpatine shows his true colours after Ezra defies him and brings in his Royal Guard to kill him now that he is no longer useful but Ezra manages to escape and comes face to face with Thrawn once again. His presence here is much more assured and confident knowing he has right on his side and everything he needs to face Thrawn down to prove that he’s the better person. As I’ve said overcoming impossible odds is pretty much the mission statement of this show and finding creative ways to do it has always made for interesting viewing. In this case Ezra arranges for the summoning of a pod of Purgills; last seen in “The Call” to come to their aid. They are more than a match for Thrawns Star Destroyers and turn the tide of battle in a visually interesting and exciting way. 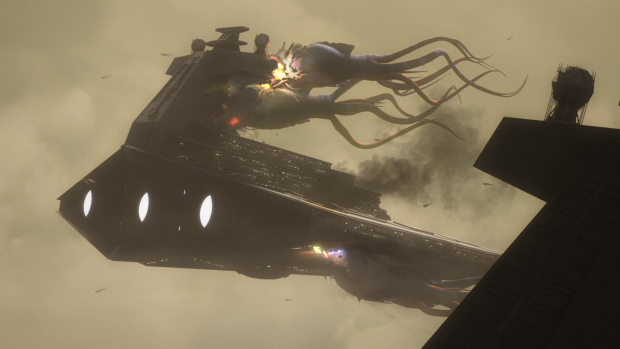 It’s a solution unique to Ezra who has always had an affinity for communicating with animals be it a Loth-Cat, Loth-Wolf or a giant tentacled space whale. There’s a lot of emotional heft to this sequence as Ezra has resigned himself to a fate that he has accepted. Thrawn tells Ezra that whatever happens next happens to both of them. It is meant as a threat but Ezra has already considered this and accepted what is to come. He is more than willing to make the ultimate sacrifice to protect his family and defeat Thrawn. Once again it shows that he understands Kanan’s decision and proves that he has the strength to make the same choice. It’s a very powerful moment with a confident performance from Taylor Gray as Ezra says goodbye to everyone he loves. It isn’t the last we hear from Ezra as he has recorded a farewell message where he points out that there were a lot of paths in front of him but the only way to save his family was to take the one he least wanted to. It’s clear that he doesn’t regret his decision because he was able to save everyone he cares about but not getting to see his family again is a source of sadness as it should be. His words do bring the hint of hope when he tells Sabine that he’s counting on her even if she doesn’t know what he’s counting on her to do. He also says that he “can’t wait to come home” indicating that he’s not really saying goodbye and that it’s possible he will be found. 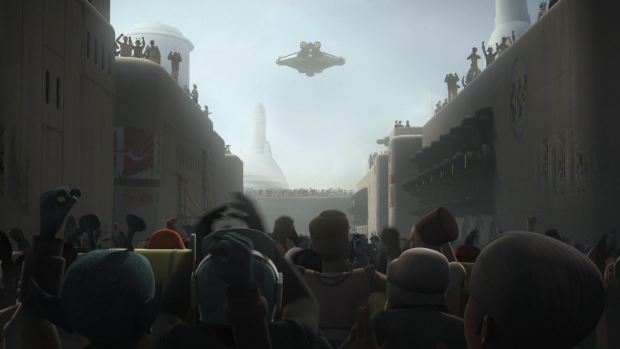 After this Lothal is freed and people cheer as the Ghost flies overhead. Their actions have given the people of Lothal the confidence and motivation to resist the Empire should they come back to reclaim the planet showing how important their actions have been and that there is always hope. This has been a consistent theme throughout the entire Star Wars franchise so ending this series on a strong example of how a small group can make a difference feels right. An epilogue skips ahead to after the events of Return of the Jedi and confirms what happened to all of the characters. Hera survived, fought in the battle of Endor and had a son where Kanan was the father. This raises a lot of questions that are best left to the imagination but it’s great to see that there’s a happy peaceful ending for Hera. Zeb takes Kallus to the new Lasat home world to show him that he didn’t wipe out the entire species and to welcome him as one of their own. It’s an incredibly touching ending for these characters that concludes Zeb’s journey towards forgiving Kallus for all he has done. Their relationship has developed over the course of the series in various ways and this is the perfect end point. It feels earned and fits perfectly with their character arcs. Sabine stayed on Lothal interpreting Ezra’s final words to her as an obligation to protect the planet he called home. 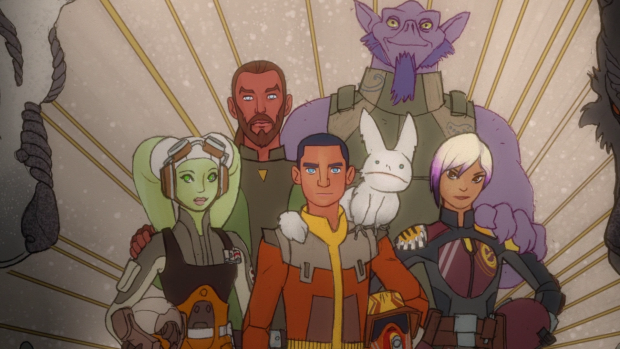 There is no mention of Mandalore which makes sense given the context as the more recent episodes have been about how the Ghost crew are connected to Lothal so Sabine’s ending is better served in connection to the planet she adopted rather than the planet she is actually from. 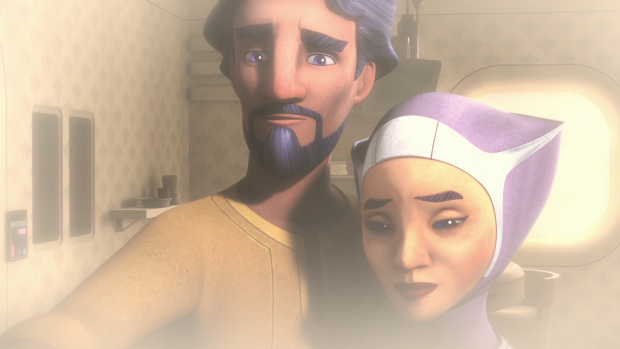 The episode ends with Sabine realising that Ezra is still out there and making it her mission to bring him home. 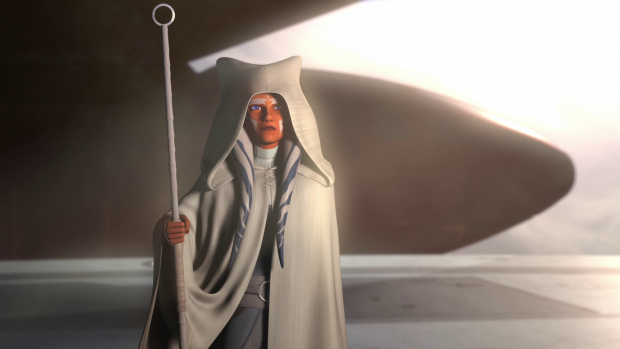 Ahsoka appears to her to help with the search and the episode ends with the suggestion of further endings. I personally prefer endings that confirm how the characters continue rather than wrapping everything in a neat package. The episode succeeds in removing Ezra from the events of the Original Trilogy paving the way for further adventures following Return of the Jedi. It’s unclear what the next animated Star Wars project will be but considering this show follows on from Clone Wars in lots of ways I would expect the next animated series to draw on the events of this one to tell its story. I’m certainly interested to see a post Return of the Jedi set series so I hope that’s what comes next. It wasn’t all great but then again nothing is. The only criticism I had was how irritating and pointless Hondo was. He has always been a problematic character in my eyes so nothing really changes here. He and his partner do serve a purpose but I could have done without them in favour of more focus on the main characters. Unfortunately Zeb takes too much of a back seat as well outside of his touching ending and excellently handled fight with Rukh resulting in a darkly funny death for Thrawn’s main henchman. A deeply satisfying ending that delivers an emotional gut punch when closing off Ezra’s arc. His test at the hands of Emperor Palpatine involving the possibility of travelling back in time to save his parents plays out beautifully as does his sacrificial moment where he fully accepts that the Ghost crew are his family. His plan to summon the Purgills felt unique to him as a character and allowed for a really impressive action sequence. Ezra’s sacrifice neatly removes him from the events of the Original Trilogy while leaving the door open for further adventures in the future so it was immensely satisfying to see. The episode boasts impressive action that isn’t quite as good as the previous episode but ably replaced spectacle with tension and still allowed the characters time to shine. Showing what happened to the characters in the form of an epilogue taking place following the events of Return of the Jedi was a really nice touch especially when it came to Kallus learning that he didn’t kill the entire Lasat race and being accepted as one of them. It was a really touching moment that landed perfectly. Hera getting a peaceful happy ending was great as well and Sabine realising that she can bring Ezra home with the help of Ahsoka suggests that these characters aren’t done with yet. Outside of some minor problems mainly involving Hondo and keeping Zeb in the background this is a finale done the way finales are supposed to be done. I’ve been a fan of this show since the beginning and have been reviewing it since then too. Like any show it has its ups and its downs but on the whole it has been a very entertaining show that respects the spirit of the Star Wars franchise while being unafraid to play around with many of the accepted ideas. It’s a very character driven show with a small collection of them being the main focus. It differs to The Clone Wars with its expansive cast by telling the more intimate story of a small group of people making their way in a Galaxy being strangled by tyranny. They have profound effects on the universe as a whole without doing anything that breaks canon so the writers covered themselves nicely there. Adding in familiar faces like Tarkin and Darth Vader did nothing to create inconsistencies with the films. It fits effortlessly into the universe and tells its own story within that framework. The core relationships were usually really well handled. Kanan and Ezra’s master/apprentice connection is among the best we’ve seen in this universe and the added complication of Kanan not having completed his training made it especially unique as Kanan was learning just as much as Ezra was while doubting his own confidence and abilities. In later seasons this dynamic fell away somewhat but the progression of Ezra and his powers made this feel appropriate. It was always a strong relationship and developed nicely over the run of the show. Kanan and Hera as a couple was kept to the background with strong hints until finally confirming it shortly before his death. Together they were essentially the parents of the Ghost crew and had the responsibility of shared leadership when it came to their missions. As characters they were great separately as well as together and their relationship was consistently interesting throughout. 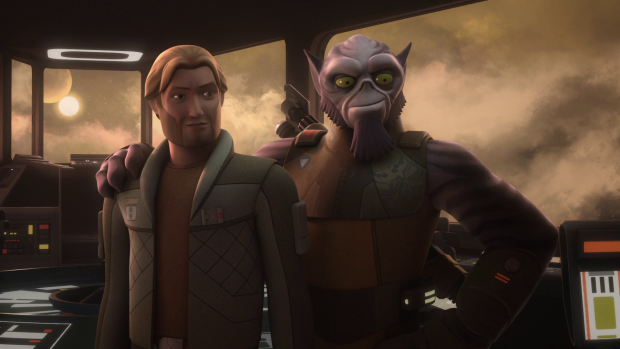 Sabine and Zeb suffered from a lack of development some of the time though Zeb’s pain over the loss of so many of his people made for fascinating characterisation and his difficulty forgiving Kallus allowed a consistent through line for him. Sabine gained a lot of development when Mandalore became a big part of the story and she started to embrace her heritage in order to promote change for her people. This added layers to her and brought out the compelling character that was always lurking beneath the surface. Her artistic side was always really charming and her skills in battle are practically unmatched. Chopper was as fleshed out as any iconic Star Wars droid and belongs in the pantheon occupied by R2-D2, C-3PO and now BB-8. He was always a hapless borderline incompetent addition to the crew and was charming in his own roguish way. Like any family member he comes through for the team where it counts and contributes to the dynamic in his own way. The show did a lot of good work with side characters both new and returning from The Clone Wars. It was good to see Rex, Ahsoka and others find new life and have some form of resolution to their stories started in the prematurely cancelled predecessor. Finalising the arc of Darth Maul was also welcomed and new characters like Kallus were always compelling as well as short term villains like the various Inquisitors. In short, a lot of thought went into this show and everything from the setup to the visual aesthetic was very Star Wars. It feels at home with the universe seen in the films while also having its own unique visual identity. Seeing new ship designs, iconic planets and variations on common fixtures such as Stormtroopers was always welcomed. The finale does a great job of wrapping the show up while making room for more stories and I’m glad to say the ride of watching this show was a worthwhile one.